Members of the Wahama wrestling team pose for a picture after winning the first-ever Battle of the Birds tri-match held Wednesday night at Belpre High School in Belpre, Ohio. BELPRE, Ohio — The White Falcons proved to be birds of a different feather. 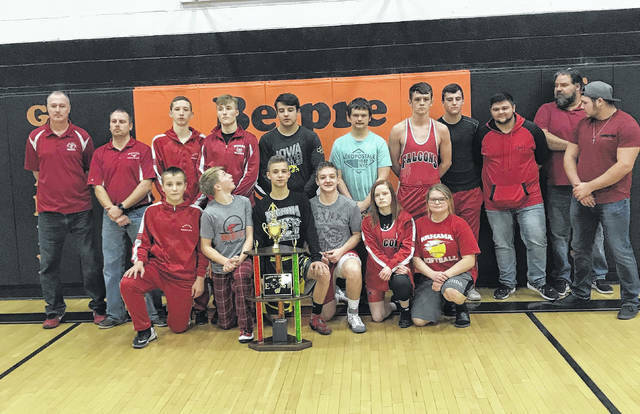 The Wahama wrestling team posted wins over both Eastern and host Belpre to claim the first-ever championship of the Battle of the Birds tri-match held on Wednesday night in Washington County. The White Falcons soared to the top of the final results after posting a 54-24 win over EHS and a 51-30 victory over BHS. The Golden Eagles took second with a 36-30 decision over Eastern in the other head-to-head contest. Wahama had eight of its 10 grapplers finish the night with perfect 2-0 marks individually, while the Eagles had only two wrestlers accomplish the same feat. Ethan VanMatre (120), Trey Peters (126), Trevor Hunt (132), Ethan Herdman (152), Gabe Roush (160), Jase Heckaman (170), Christian Thomas (182) and Antonio Serevicz (220) all posted perfect marks for the Red and White en route to the team championship. Emma Tomlinson (106) ended the night 1-1 overall for WHS, while Shawn Taylor lost both of his bouts at 195 pounds. The Green and White were led by Dillon Aeiker (138) and Steven Fitzgerald (195) with unbeaten marks of 2-0, while Daniel Harris (145), Nick Little (220) and Nathan Litchfield (285) finished the evening 1-1 overall. Emily Bunce went 1-0 at 182 pounds, Gavin Erwin was 0-1 at 182 pounds, and Luke Allen ended the night 0-2 at 152 pounds. No other Belpre information or results were available at press time.